Mukota Pigs, also known as the Rhodesian Indigenous or Zimbabwe Indigenous pigs, are primarily found in Zimbabwe, but they also are found in Mozambique and Zambia. 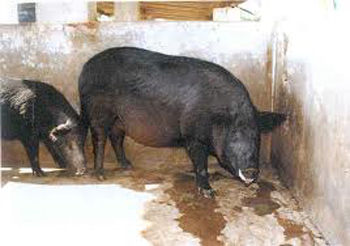 Mukota pigs are black, hardy in the tropics, resistant to disease and poor nutrition, and require little water (6 liters per week). They fall into two broad classes. One is short and fat, with a short snout resembling that of the Chinese Lard pig. The other resembles the Windsnyer (Wind cutter) pigs, with long snout and razorback. They are believed to have been introduced in the 17th century Europe and China trade and are named after the Mukota region of northeastern Zimbabwe. Reproduction follows an annual rhythm with peak farrowing in the early rainy season (October/November). Age at first litter ranges from 6 to 12 months, with mean litter size between 6.5 and 7.5. Carcass yield is about 30 percent less than from the exotic Large White pig, but is considered tasty and sweet. Mukota pigs show moderate parasite tolerance and are less prone than imported varieties to internal parasites within commercial agriculture.